A myriad of diamonds clothes the Cat’s Eye in light, accentuating the curves of its silhouette. Behind the scenes are the mechanics of perfection. Time beats to the rhythm of a self-winding movement manufactured by Girard-Perregaux. The Cat’s Eye Haute Joaillerie showcases highly skilled crafts where beauty and technology complement one another in perfect harmony. Draped in 150 emerald-cut precious stones, the case illuminates its feminine curves. The flower-shaped crown unfurls its petals to reveal its heart: a rose-cut diamond. The hours display blossoms on a bed of gemstones that emphasize the emblematic case shape. Starting with the small seconds, the iridescent oval progressively broadens with uniform brilliance. The dial, adorned with a delicate “Clous de Paris” hobnail motif, includes 102 emerald-cut diamonds, selected and positioned in order to deliver maximum brilliance. A traditional technique requiring a particularly delicate touch, the “Clou de Paris” hobnail motif consists of holding several stones with a single “clou” or pin, meaning that the diamond cutter must cut and calibrate the stones meticulously, one by one. The sapphire crystal, rounded in both directions, tops the dial and its leaf-shaped hands. 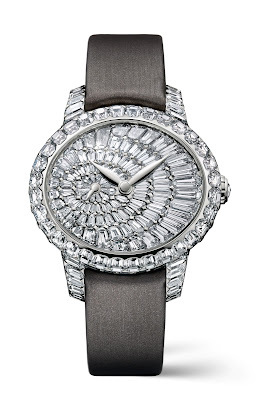 A taupe-colored satin strap enhances the sparkle of the stones. The contrast is subtle, the union a success. Extended by an ardillon buckle set with 13 baguette-cut diamonds, it encircles the wrist with unforgettable moments in time. Finally, the hand-engraved case back opens onto the caliber GP03300 self-winding movement whose oscillating weight adopts Girard-Perregaux’s tapestry decoration. The date has been set. 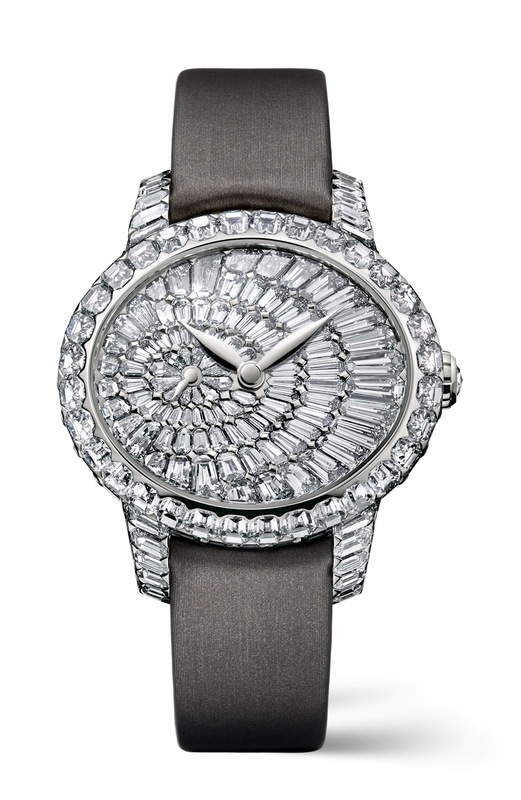 Created in 2004, the Cat’s Eye collection dedicates beautiful watchmaking pieces to women. The refinement of the pieces rivals their attention to detail. Its emblematic design, which has won numerous distinctions, is highlighted by precious materials and manufacture movements, both simple and with complications. The collection proves that fine watchmaking is far from being the prerogative solely of men.